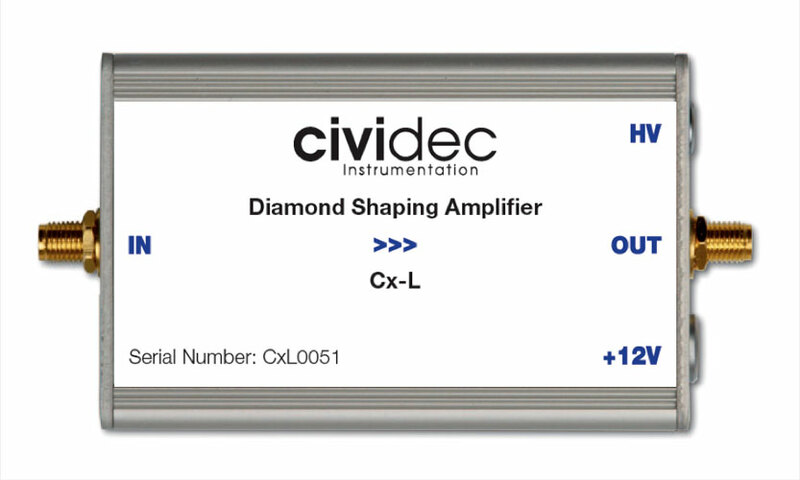 The Cx-L Spectroscopic Amplifier is an ultra low-noise charge amplifier with a shaping output stage. The Cx-L is designed for applications where long detector cables can be connected between detector and amplifier. This amplifier is escpecially suited for spectroscopic detector applications under vacuum or in a cryostat. The Cx-L is ideal for precision spectroscopy with high capacitive input loads. 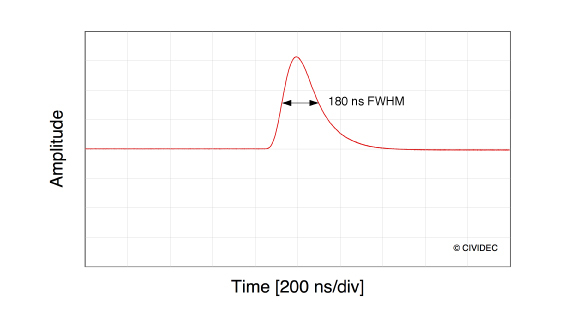 Gaussian pulse shape with FWHM = 1.2 μs for the usage with conventional multi-channel analyzers (MCA). The Cx-L Spectroscopic Amplifier has a Gaussian output signal with 180 ns FWHM. The low baseline noise of 300 electrons allows high-resolution particle spectroscopy, in particular for high particle rates up to 1 MHz. The width of the Gaussian output signal can be customized for the readout with a conventional multi channel analyzer to 1.2 μs FWHM. The Cx-L Spectroscopic Amplifier is an inverting, unipolar charge amplifier with a linear output range of +2V. The excellent linearity of the amplifier shows a gain of 12.5 mV/fC. 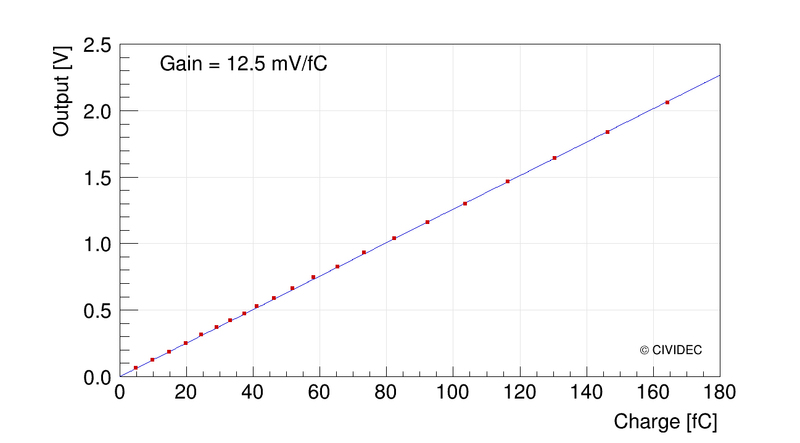 The linear input range of 180 fC covers a dynamic range of 15 MeV energy deposition in diamond. The gain of the amplifier can be customized on demand. The Cx-L Spectroscopic Amplifier is optimized for particle spectroscopy with high capacitive input load. 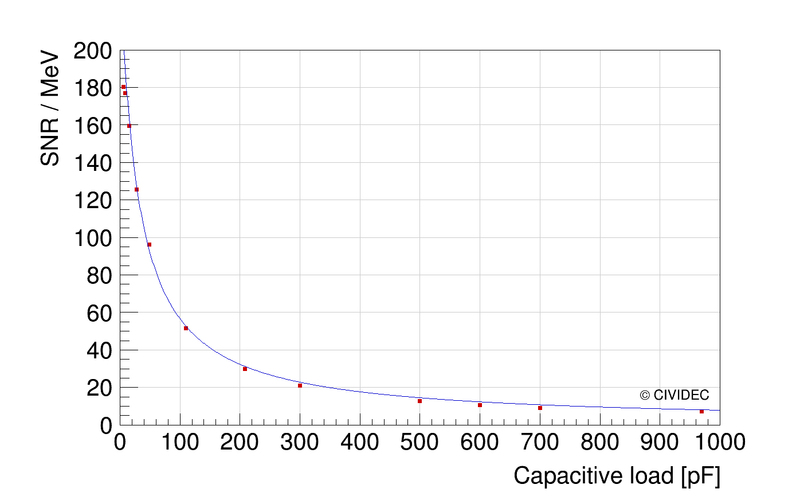 The signal-to-noise ration (SNR) for 1 MeV energy deposition in diamond detectors, as function of the input capacitance is shown in the Figure. At 1 nF input capacitance an SNR of 10 is achieved for 1 MeV equivalent energy deposition in diamond. This shows that the Cx-L Spectroscopic Amplifier can be operated with 10 m long 50 Ω cables at the input.